Today was our last full day in northern California. We first visited the Monterey Bay Aquarium, which I have to say, is the best aquarium I have ever visited. Monterey was the capital of Alta California under both Spain and Mexico. Then we drove down to Big Sur, a beautiful coastal region where the Santa Lucia Mountains roll dramatically upwards from the Pacific Ocean. 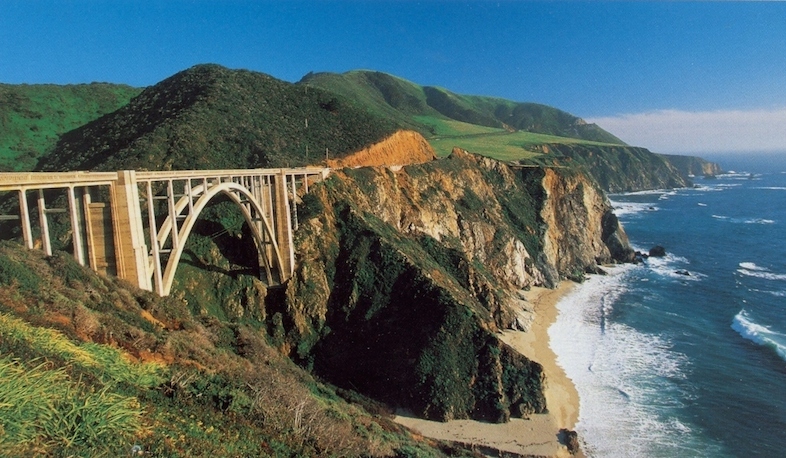 The Spanish named it “the big country of the south” because of its location south of the Monterey Peninsula. It includes about 90 miles of coastline from the Carmel River in Monterey County south to the San Carpoforo Creek in San Luis Obispo County, and about 20 miles inland to the eastern foothills of the Santa Lucias. Big Sur’s Cone Peak is the highest coastal mountain in the lower 48 states, ascending nearly a mile above the Pacific only three miles away. After driving by famous Pebble Beach Golf Course, we ate lunch in Carmel (where Clint Eastwood was mayor). We had pizza at Allegro Gourmet Pizzeria. Then we continued our drive down the Pacific Coast. We crossed the famous Bixby Bridge and stopped at an overlook at Big Sur for views of the Pacific, before heading later for a tour of Hearst Castle. 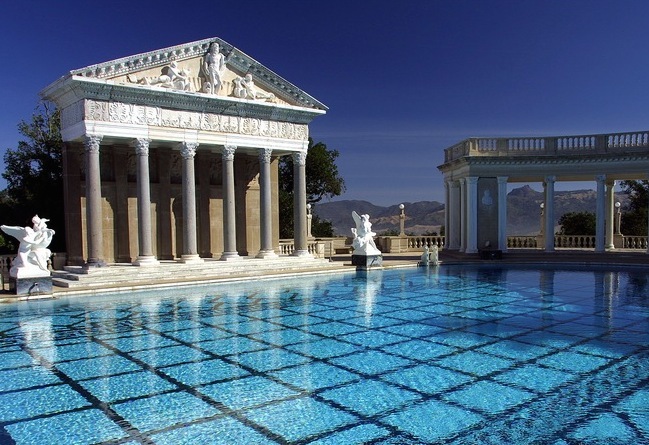 The magnificent mansion belong to billionaire media publisher William Randolph Hearst. It’s one of America’s most famous houses, but my favorite part is his elaborate swimming pool. But the real highlight is the million-dollar view of the Pacific coast. After the tour we drove down to San Luis Obispo before taking 101 back north to San Francisco. We ate dinner at Chevy’s Mexican restaurant before checking into our hotel, the Oyster Point Residence Inn San Francisco (near SFO airport). We decided to drive into the city one last time for a visit to Ghirardelli’s. We had to quench our hunger for chocolate with a banana split! I could not leave without riding the Powell-Hyde cable car from Fisherman’s Wharf to Union Square. 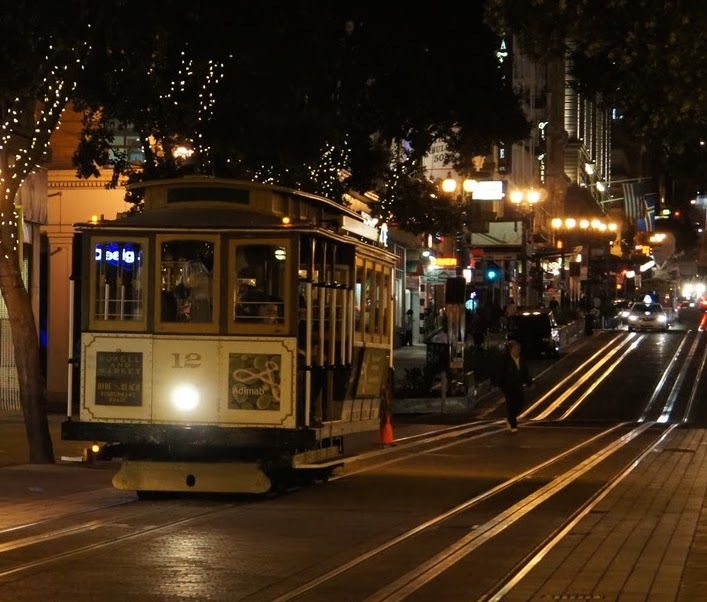 The cable cars are an icon of the city and the world’s last manually-operated cable car system. Only three lines remains, but they are wildly popular with more than seven million annual riders. The views are magnificent as the airs rushes against your face in the open cars and bell clangs. After embarking at the Hyde and Beach terminal near the San Fran Maritime Museum, Mom and Dad followed in the car as I zoomed up steep Hyde Street. At the top, the cable car took a right on Washington Street down another hill before turning up a hill and taking a right on to Powell Street. We then crested a hill at the California street crossing before a steep descent to the station at Powell and Market Streets. It was an epic way to end the trip in San Francisco. You could see the smiles on all the faces of mostly tourists on board from around the world. I am glad that the city maintains this heritage and hopefully will do so for years to come. After saying goodbye to downtown, we headed back to our airport hotel. We would leave our hearts in San Francisco one more time as we flew out the next morning from SFO.